Chinese satellite experts are said to be designing a novel spacecraft capable of breathing new life into a satellite falling back to Earth in orbital decay and extending its in-orbit life. Research and development of such “satellite savior” is gaining momentum at the China Academy of Space Technology of the China Aerospace Science and Technology Corp. The goal is to put satellites running out of fuel or experiencing technical problems back to their designed trajectories. A satellite, like any other spacecraft, relies on its battery or fuel cell to maneuver its position and maintain its height to stay in its orbit to perform various duties. Batteries or fuel cells on most satellites can last for about 10 years. A low battery or fuel cell means an otherwise well functioning satellite may gradually deviate from its designed path and ultimately descend into other orbits as space debris, or fall back to Earth and break up in the atmosphere. The new spacecraft will be engineered to connect to a target satellite via robotic arms and then provide attitude control assistance and push the device back into its proper trajectory, giving it about a decade of additional service life, according to Xinhua. It will be able to salvage one falling satellite after another in one mission, the paper said. Hu Di, the chief designer of the spacecraft, was quoted as saying that the satellite savior would be the size of an SUV weighing five tons and could be catapulted onto orbit atop the powerful Long March 3B liquid-propellant carrier rocket, with its maiden flight scheduled by 2020. “[The spacecraft] will mainly be used to service and refuel communications satellites operating in geostationary orbits about 36,000 kilometers above sea level as such satellites are typically expensive to manufacture and launch and are vital in relaying and amplifying signals,” said Hu. 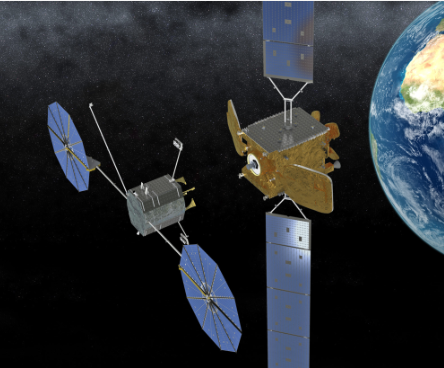 Internationally, the Virginia-based Northrop Grumman has already developed a prototype of what it calls a Mission Extension Vehicle to service satellites in a geosynchronous orbit and plans to make its first launch before the end of the year. The aerospace heavyweight said its versatile, cost-effective spacecraft equipped with the rendezvous proximity operation and docking unit and powered by hybrid chemical and electric propulsion systems can also redeploy satellites to start new orbital roles through thrust vector control and momentum management system.